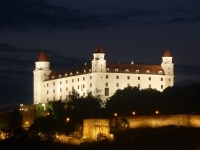 Got a question or comment about Attractions in Slovakia? Ask a Travel Expert! Home to not only incredible natural beauty but also great history, visitors in Slovakia will love what it has to offer. The High Tatras provide beautiful, unspoilt mountain landscapes, with lakes and waterfalls aplenty; one of the best starting points for hikes is Štrbské Pleso, where walking trails access the lovely Skok Waterfalls. An alternative to the High Tatras National Park, the Slovak Paradise National Park in the east of the country is also a superb hiking destination and invites visitors to explore the magical forests and valleys of Slovakia. In addition to glorious natural resources, Slovakia is home to many ancient castles and romantic ruins which are well-preserved and still in use. The most popular with tourists include Spiš Castle, a UNESCO-listed ruin and one of the biggest castles in Europe; Bratislava Castle, looming above the capital city; and Devín Castle, said to be more than 5,000 years old. Slovakia is renowned for its rich folkloric traditions and well-preserved architecture, with Bratislava's Old Town home to many historic buildings and a number of interesting skanzens, open-air museum villages, scattered around the country. The UNESCO-listed town of Vlkolínec boasts the best wooden folk architecture in the country, while the Východná Folk Festival, held annually in July in the village of Východná, is said to be one of the best folk music and dance festivals in the world.